Choose a modern apartment that suits your personal requirements. 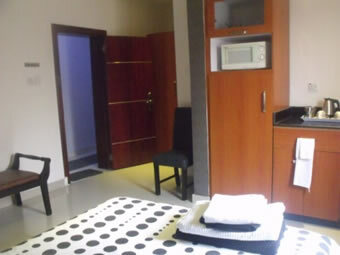 Every apartment has a kitchen or kitchenette, modern appliances, spacious, contemporary living spaces, en-suite bathrooms, flat screen Tv’s with FREE satellite channels, and choice of beddings with duvets. 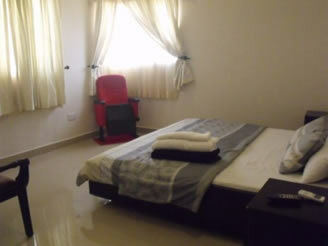 Air conditioning, housekeeping and more delights are also provided for all apartments. •	Electronic Secure RFID card lock entry system. •	Work desk with desk lamps. *26 sq.m modern open-plan apartment design. *32’ Flat screen television with selected satellite channels free. Very Stylish! Boasts of modern open-plan designs and layouts. Larger than all other studios. Has larger kitchens, unique bathrooms that feature stone relief walls, large shower spaces. Bespoke hand-made sofas and center tables, plus coffee machines for your own private brew. This is ideal for the traveller on longer stays. Perfect mid-positioned product that delivers style, space and price. Great value here. Ideal for a single long term professional or even a couple with a child under 15 years. Enjoy upgraded features and amenities plus it’s more elegant the more comfortable. Features: Includes everything in a Premium/deluxe studio plus a lot of extras: Larger, deluxe bathroom, sofas, a dining table sitting 2, an upgraded work-area, more storage space and shelves, a Queen-sized double bed to stretch out in and also your own coffee maker. TRUE LUXURY! * You will ‘never need a hotel’ once you experience this. Ideal for the Cosmopolitan Professional, Senior Executive, Expatriate teams or just a Couple on a quiet weekend break. Our 1-bed apartment offers LUXURY with privacy in exquisite contemporary living spaces. Enjoy massive space, a separate bedroom and VERY large separate living room to compliment your executive stay. Vastly larger than hotel rooms, (55+ Sq. Meters Average size) it boasts of bespoke hand-made furniture, 42’’ TVs, 7 x 7, King beds in the bedrooms, unique art pieces, glass block showers, work areas plus much, much more. With high ceilings, stone relief walls, With a full dining table (sits 6 comfortably), a large en suite bathroom, a fully equipped modern open plan kitchen, a double bed or twin-double beds (in the family class), bespoke sofas in the living rooms and a 42’’ flat screen television with selected satellite channels. A home theater system with surround sound speakers, music system, a DVD player for home entertainment, all ensure that you can relax in the utmost comfort when not working. A work desk with international wall sockets to ensure that all your gadgets can be powered while you work, separate cable connections allowing you bring and plug in your own private Cable decoder should you want, Ipod docking stations and more, this is the ultimate game changer for your stays. 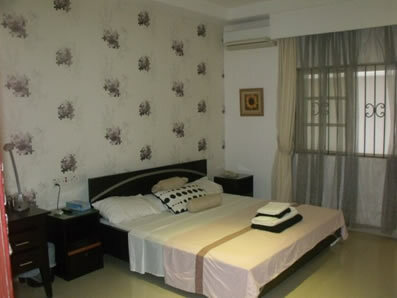 Apartment Size: 53 - 58 sq.m, Max Occupancy: (4) 2 Adults + 2 kids. Features: EVERY THING you will need to enjoy your stay in luxury, comfort and style. * You will never need a hotel once you experience this. Family stay in Style! Ideal for the modern the top business Executive, Family of 6 traveling or on short breaks in Lagos or for visa applications. They are configured to take a family with up to 4 kids. The family 1-bed apartment offers 2, twin double beds in its bedroom, a very large family bathroom with space for every family member, a beautiful living room, with a full kitchen with hobs and a dining table set for 4, expandable to 6 places. A complimentary video game / console to keep those kids quiet (or for even the grown-ups too). An assortment of novels, magazines are also thoughtfully provided for your relaxation and reading pleasure. With a full dining table (can sit 6 comfortably), a large en suite bathroom, a fully equipped modern kitchen, twin-double beds in the bedroom, a sofa in the living room and a 42’’ flat screen television with selected satellite channels, a home theater system with surround sound speakers, music system, a DVD player for home entertainment, and more to ensure that you can relax in the utmost comfort when not working. 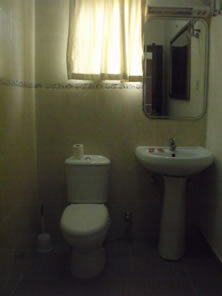 Apartment Size: 53 - 58 sq.m,	Max Occupancy: (Family of 6): 2 Adults & up to 4 children under 15 years. *It has everything you will need to enjoy your stay in luxury, comfort and style. With experienced & friendly staff, constant power, good armed security, quiet ambience, broadband internet and IDD access, select cable TV channels for breaking world news, and an international multi-plug to power all your accessories, it’s easy to stay well-connected whether you’re on business or travelling for fun. * Quiet rejuvenation. 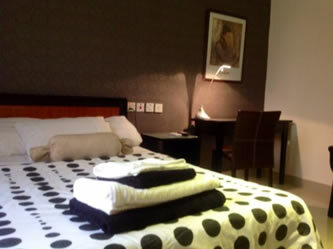 * Guest facilities to help you optimise your time. * Completely non-smoking indoors. *Please note that not all facilities maybe available in every apartment and some may incur an additional charge. For detailed information please contact us.